Satelec is the first manufacturer to offer autoclavable ultrasonic handpieces with integrated electroluminescent diodes (LED Light). Add its incredible range of power, plus an ability to handle multiple applications and you have one of the most versatile ultrasonic instruments available today. 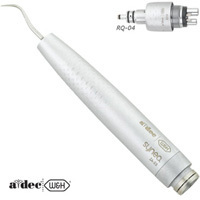 One handpiece to perform perio, endo, scaling, post removal and apicectomy.